The freezing conditions didn’t affect the celebration at the Lost Dogs’ Home today when Australia Post launched the ‘‘Adopted and Adored’ features five dogs fortunate enough to find new, loving homes thanks to the efforts of shelters like the Lost Dogs’ Home. 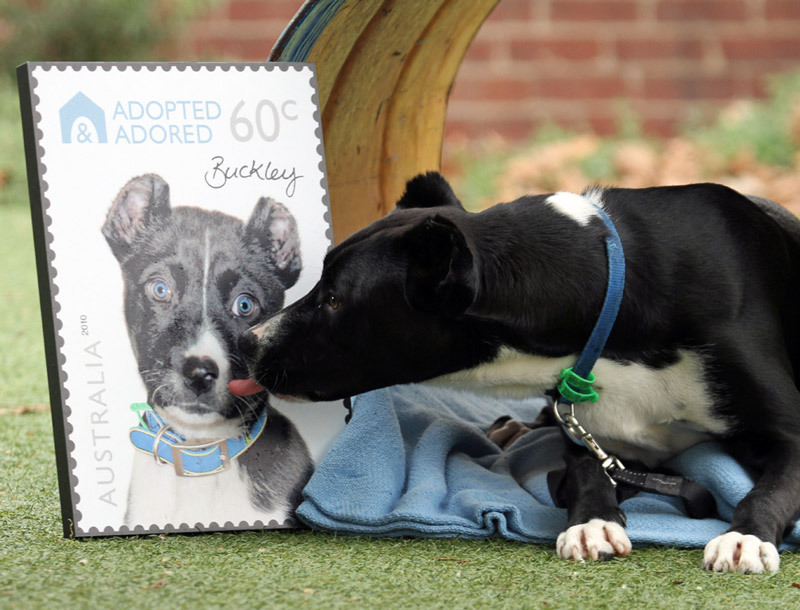 Buckley the pup – now all grown up – graces one of the stamps, along with West Highland Terrier cross Daisy, also adopted from The Lost Dogs’ Home. The pair happily greeted Home supporters and dignitaries and posed for photos with their oversized stamps. “It is fantastic to see Australia Post, through this stamp issue, getting behind us in an endeavour to promote the Home’s dogs for adoption. Our dogs make great pets. They really appreciate the opportunity of a new, loving home.” Commented Dr Graeme Smith, OAM. Tigger – a young Border Terrier cross, from NSW Animal Rescue. ‘Adopted and Adored’ is available to purchase from participating Australia Post retail outlets, via mail order on 1800 331 794 or online.